Born in a Nepali village, Swarnim has had a remarkable journey from the rural Himalayas to global seats of learning and professionalism. He is a development economist with more than 10 years experience working in international organisations, and has specialised research interests in trade, investment and public finance. Swarnim holds a PhD in economics from The Australian National University, an MPA in International Development from Harvard, and a Bachelor of Science (Econ) from the London School of Economics. 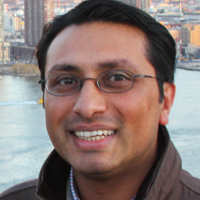 Swarnim was recently appointed to the staff of the World Bank in Washington, DC as a senior economist. In 2012-2013, Swarnim served as a policy specialist at the United Nations Development Programme (UNDP) in New York where he co-authored the latest human development report, The Rise of the South. The report chronicles the profound shift in global output, power and voice as a result of the rise of a large number of developing countries, especially China. It discusses the opportunities as well as challenges posed by the rise of the South both to lagging countries and the rest of the world. As a citizen of Nepal, sandwiched between China and India, Swarnim is keen to explore ways in which the emerging might of large developing countries can be leveraged for a faster development catch-up by small countries like his own. Swarnim’s interest in economic policy goes back to his five-year experience co-leading the UNDP Asia Trade Initiative from 2002-2007. The initiative aimed at making the Doha Round of WTO trade negotiations development-friendly. This involved advising governments and designing UN-supported trade projects. Two of his most notable assignments concerned China. In 2004, he was invited by the Chinese Ministry of Commerce to advise on the Agreement on Trade-Related Aspects of Intellectual Property (TRIPS). In 2006, he was invited again to visit the provinces of Yunnan and Guangxi adjoining Vietnam to design a cross-border economic project in anticipation of the implementation of the China-ASEAN Free Trade Area by 2015. While pursuing his PhD, Swarnim worked at the World Bank Group (2009-2011), where he co-authored Investing Across Borders 2010: Indicators of Foreign Direct Investment Regulation in 87 Economies and the Trade Competitiveness Diagnostic Toolkit 2012. Swarnim has also been a consultant at the National Planning Commission of Nepal, the Asian Development Bank in Manila, and the International Trade Center in Geneva. Having been the South Asia editor of Harvard Asia Quarterly (1999-2000) and a regular broadcaster on BBC Nepali Service (1995-1997), he maintains a keen interest in current affairs. The GEV fellowship appealed to Swarnim because of the unique opportunity it would provide to interact with a diverse group of scholars and practitioners united by their interest in China. As a South Asian, he is particularly looking forward to engaging with peers on how the rise of China can be expected to unfold. Overall, the policy discussions also mesh with his interests as a development economist concerned with why some countries progress much faster than others.